Construction on the Rio Hondo mechanical lift bridge is seen Thursday. TxDOT officials say work on the mechanical lift bridge could be finished earlier than expected, maybe by the end of the year. The disruption on FM 106 caused by the closing of the bridge has been an economic hit to the town. RIO HONDO — There is light at the end of the bridge. 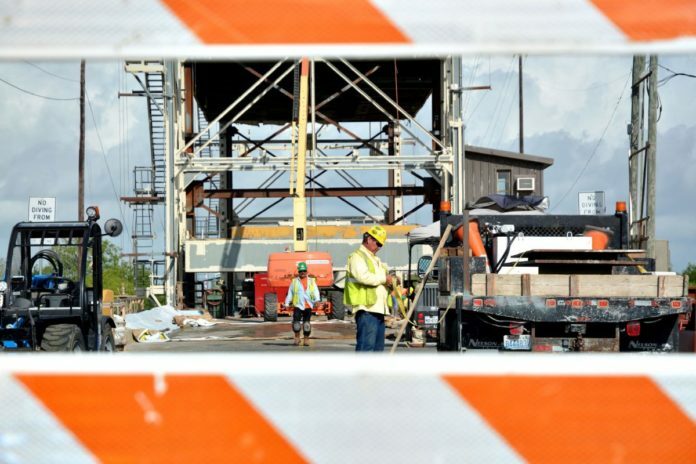 Texas Department of Transportation officials say the long-running shutdown to allow for the renovation of the city’s historic mechanical lift bridge could finish two months earlier than the February date now projected — maybe by the end of the year. “They’re ahead of schedule,” said Hector Gonzalez, TxDOT’s deputy district engineer for the Pharr district. The $12 million refit of the mechanical lift bridge which opened in 1953 has cut the community in half, with people living on the west side of the Arroyo Colorado forced to make a major detour to arrive on the east side where most of the city’s retail establishments are located. The bridge was completely closed off on Sept. 26. At the time, TxDOT officials were optimistically saying the work would be completed in 11 months and the bridge would be back in working order in August. Since then, the retail sector in this city has taken its share of the fallout from splitting the city in half. The sales tax reimbursements from the Texas Comptroller’s Office tell the tale: Up strongly in December and January, the monthly sales tax allocations for February and March plunged almost 20 percent from the previous year. Jason White, owner of Rio Hondo Lumber and Supply, said he didn’t know how much longer he could keep the Rio Hondo store going. White owns another hardware store in Port Isabel which he said is doing well. Here it’s another story, and he said he’s had to reduce his full-time staff from eight to three, with one part-timer. “It doesn’t seem to be worth keeping open,” he said. But other business people in the city of 2,300 say they have weathered the economic downturn so far, and think the city will come out of its tailspin soon. McMillen said the bridge closure’s major effect on Rio Hondo may be the decline in boat-trailer traffic headed east to ArroyoCity and the fishing in the Laguna Madre. McMillen said she doesn’t know of any businesses in the city which have been hurt so badly they’ve had to close. “I think the ones that have probably suffered are the liquor store with the guys (boaters) driving through, and a little bit of the restaurant business,” she said. City Manager Ben Medina hopes when the bridge is finished, and with the widening and repaving of FM 106 (also known as General Brant Road), Rio Hondo can return to being a jumping off point for sport fishing in Arroyo City, and also serve as a route to Port Isabel and South Padre Island. The reconstruction of 11.4 miles of FM 106 from FM 1847 to FM 510 began in 2015 and is more than half finished, TxDOT said. Final completion date for the $15.5 million project is sometime in February. “We understand TxDOT will finish General Brant Road, which is the connection to Laguna Atascosa National Wildlife Refuge as well as Port Isabel and the Island,” Medina said. “So people can come through here and shorten their distance to the Island, time-wise,” he added.